Cytokines are produced and function at a micro environmental level: intracellular assessment has only recently become practically feasible. We used 3-color flow cytometry to examine surface and cytoplasmic antigens on peripheral blood lymphocytes of 18 normal donors, assessing the applicability/comparability of various directly conjugated anti-human cytokine reagents and stimulation protocols using separated cells or whole blood preparations. Interdonor variability far exceeded variability due to reagent or stimulation and separation techniques. Based on all results with various reagents, post 4-5.5 h stimulation with PHA/PMA/ionomycin, the range of the percents of T lymphocytes producing various cytokines included: gamma-IFN-13.2-65.0%, IL-2-10.0-56.7%, and TNF-alpha-17.1-79.2%. Compared to CD8+ cells, CD4+ cells more often expressed IL-2 (mean 45.7% of CD4 + vs. 21.4% of CD8+ p < 0.0001), less often expressed gamma-IFN (18.5% vs. 55.3%, p < 0.0001), and did not differ in TNF-alpha expression (52.9% vs. 59.4%). 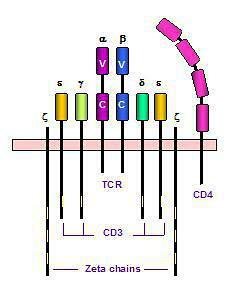 Of T cells producing gamma-IFN, 64.8-100.0% also produced TNF-alpha 3.5-100.0%, IL-2. Of T cells producing IL-2, 6.0-63.9% also produced gamma-IFN and 37.6-100.0%, TNF-alpha. These results demonstrate the broad spectrum of cytokine patterns in normal human adults, as well as the usefulness and limitations of various currently available cytokine products.